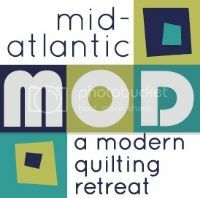 The retreat is focused primarily on meeting new friends and hanging out with existing friends, so lots of open sewing time and socializing events are being planned, rather than workshops. We have designed the event to hopefully be affordable for most people by setting the prices to reflect our actual cost to hold the event. To that end, we have also decided not to organize an "all-inclusive" event that includes workshops and food, but instead we have arranged for food to be "on your own" (which provides attendees with more flexibility regarding their meals) and we will be focused on inexpensive social activities (e.g., inter-guild swap, progressive quilt, informal shop-hop, mini-workshops, etc.). Your attendance fee will cover open sewing time in a large conference room. Each attendee will get his or her own table for the entire 4-day retreat. All attendees will also have the option of participating in an inter-guild swap, joint show-and-tell, short skills workshops (additional fees will apply, details to be announced later), and more. Activities will be announced on the retreat website once the details are confirmed, so make sure to check that page periodically. For Philly MQG members who completed our pre-registration questionnaire several months ago, early registration is already open. You should have received an e-mail with instructions on how to register. Your "early registration" deadline is Tuesday October 15th. If we have not received your registration AND payment by that time, your spot will be made available to others. For the rest of the Philly MQG (i.e., current members who did not complete the questionnaire), you may complete the registration form in advance of our October meeting (the registration link will be sent out through BigTent) and, if there are spots available as of October 15th, you will be able to complete your registration by submitting your payment at the meeting or later. If you have any questions, please contact Andrew through e-mail or on BigTent. Registration will open for the general public on November 1st at 9:00 AM Eastern Time if there are still spots available. The following information is from the Mid-Atlantic Mod website–feel free to look around or click on the contact us link on that website if you have any questions. Lodging: Room rate is $129 per night for single or double occupancy (meaning ~$65/night each). Reservations should be made on your own.